Notice! Pine Bay Holiday Resort does not accept reservations at this time. Please try again later. Pine Bay Holiday Resort Contact. 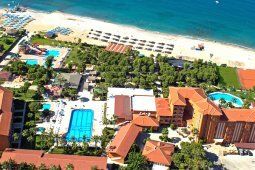 Pine Bay Holiday Resort is located in Çamlimanı Bay, one of the most beautiful spots of Kuşadası, and offers its guests a unique holiday in a position to embrace the Aegean waters. There is a private beach of the hotel which is set among the greens. The facility has a warm design in standard rooms and bungalows; air conditioning, balcony and minibar. Registered guests renewed in 2014, the hotel's rich cuisine can try delicious tastes. There are bars that serve with different concepts in the facility which is also ambitious for entertainment. There is also a swimming pool, children's animation and a children's buffet for children with 3 separate swimming pools. Also in the facility; tennis courts, mini golf, mini football, water bicycle and table tennis. There are 1 open main restaurant, 2 indoor main restaurant, piano bar, foyer bar, pool bar, tennis bar, 2 outdoor swimming pools, 1 indoor swimming pool, 4 children swimming pools and childrens water slides, 7 slide aquapark, Turkish bath, sauna, jacuzzi, massage, fitness center, hairdresser, boutique, market, doctor, dry cleaning, laundry, tv room, game room, billiards, disco, tennis court, floodlight tennis court and tennis equipments, mini football, , beach volleyball, aerobics, water gymnastics, banana, parasailing, jet ski, canoe, diving, water slide, animation, meeting rooms, children's club, baby sitter, playground, deckchair, umbrella and mattress are available. Children: The facility offers a swimming pool, children's club, babysitter, children's playground, children's play room and toys for small guests. Pine Bay Holiday Resort accepts VISA and reserves the right to temporarily hold an amount prior to arrival. Pine Bay Holiday Resort accepts Master Card and reserves the right to temporarily hold an amount prior to arrival. Pine Bay Holiday Resort accepts Maestro and reserves the right to temporarily hold an amount prior to arrival. Pine Bay Holiday Resort accepts American Express and reserves the right to temporarily hold an amount prior to arrival. Pine Bay Holiday Resort accepts Bank card and reserves the right to temporarily hold an amount prior to arrival. Pine Bay Holiday Resort accepts ATM card and reserves the right to temporarily hold an amount prior to arrival. Buffet breakfast, late breakfast, lunch, local alcoholic and non-alcoholic beverages are free in case of service in all-inclusive system. The facility will serve as half board as of October. All drinks are provided at a charge. Gluten-free special service; Gluten is not found in meals. There is bread without gluten. In order to benefit from this service, it is necessary to inform our travel advisors or agencies about the purpose of notifying us beforehand. Some of the facilities that provide service throughout the year; There may be differences in their concepts. You can get detailed concept information or information about toll-free services from our offices, catalogs or sales consultants. Private - VIP bathroom set-ups will be placed. During the stay, free soft drinks and sandwiches will be available in the Villa. Ala Carte Restaurants will be given priority. Free lap-top and high-speed internet connection service will be provided. Between 01 June - 31 October 2017 there is a minimum 3 night stay requirement. The facility serves half board between 26.03.2011 and 31.03.2011. The facility aquapark serves between 01.05.2010 - 15.10.2010. The check-in time for the facility rooms starts from 14.00. The departure time from the rooms is no later than 12.00. Tesise pet is not accepted. Wireless internet is free in the lobby. Disco entrance free of charge, drinks charged. Ultra All Inclusive, All Inclusive and Full Board accommodation provided on premises starts with dinner, includes dinner until the number of nights stayed and ends with noon on departure day. Half-board accommodation starts with dinner, includes dinner until the number of nights you stay, and ends on the morning of departure with breakfast. Bed and breakfast accommodation ends with breakfast on the morning of check-out day. Nice resort. service was amazing, had to switch from bungalow once, that was no problem and it was done in 10 minutes. Nice view and food was good. First thing is we orderered a room in main facility of hotel but we get bungalow that is at least 3 star quality. Dirty floor, bugs, and the cleaning crew was probably very tired cause they cleaned my room maybe 3 days of 7 days of stay. I posted photo of "cleaned" floor and "made" bed. No fresh towels every day, tips disapeares every time. Anyways. Food - brilliant, lot of choices and lot of tastes. Everyone can get something for. Animation crew is awesome. Not so annoying like in most of hotels. They know what they need to do to make you move and smile. Lot of attractions nearby like jetski, parasailing, diving or so many more. Lot of places to take near swimming pools and by the beach, also wooden cabins to relax. Main facility is very clean, bartenders and waiters are very kind and professional. The main problem is cleaning crew, also bungalows need to be renovate, in my opinion. Beautiful nature. Excellent climate. Perfect territory. IAnd totally useless staff on reception. They didn't help solve any problems we had. Very beautiful landscape, huge beach, a lot of swimming pools with small slides for children and big ones for grown ups. Show at night (too much sexual inuendos not for children). A large choice of food, several resgaurants and some of them with reservation. Snacks until 4.00 p.m. But the bedroom is old fashioned, the bathroom not very clean this is why I give it 3 stars. 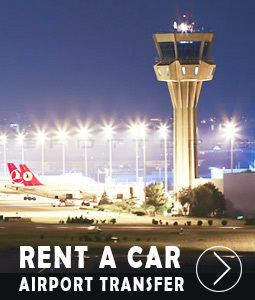 Other: Pine Bay Holiday Resort is located in Aydın / Kuşadası Çam Limanı, 65 km from İzmir Adnan Menderes Airport and 6 km from Kuşadası city center. It is at the seaside location.